EV batteries hate cold as well as extreme heat. Each has a big impact on range, too. 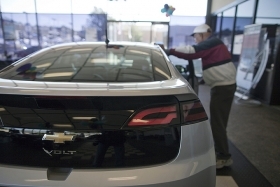 Pity the poor Midwestern Chevrolet dealer trying to sell a Volt. Ditto for Nissan dealers with Leafs on their lots. Batteries hate cold as well as extreme heat -- each has a big impact on range. My advice to those dealers: Do your test drives and special events in spring, summer and fall. About two months ago, I had a conversation with a Chevy dealer in the Midwest. He was excited. Arrangements had been made for members of a big law firm, as well as several doctors at nearby clinics, to test drive the Volt. Even with their busy schedules, these professionals made time for the test drives. They had read stories about the Volt, the electric power, the recharging that can be handled in the family garage. Each was genuinely interested in spending time behind the wheel. I believe 25 or 30 people expressed interest, wanting road time. The dealer was optimistic, crossing his fingers that two, maybe three Volts would be sold. Of course in November and December, cold winds blow across the Midwest, the Northeast and other points North. Battery range takes a hit when the outside temperature is in the 30s, 20s or lower. Randy Fox, a GM spokesman, said an electric vehicle's range depends on driving technique, terrain and temperature. Generally speaking, Fox said, a Volt can travel 35-40 miles on battery power alone in the summer when the batteries are fully charged. Last summer I experienced a Volt for several days, and after a full charge the range hit 43 miles on battery power alone. "A general rule of thumb is the Volt will experience a 5 percent loss per 10-degree Fahrenheit change in ambient temperature. So a 70- to 20-degree Fahrenheit drop results in an approximately 25 percent loss in EV range," Fox said in an e-mail. The winter cold decreases the Volt's range to 27-29 miles, Fox added. I saw that Chevy dealer a few weeks ago. I asked how many Volts he sold. I could tell his answer even before he responded. "They told me the range was too short -- 27 miles wasn't impressive. If it was in the 30s, mid-30s at least, I would have sold at least one," he said. My advice to dealers in the Snow Belt: Wait until the warm winds are blowing to schedule test drives. Thirty-plus-miles-per-charge might be the deal maker.